Briarcliff Road and Ponce de Leon Avenue are not included in the patrol areas, except the Carlton on Ponce condominium complex. Rosedale Road - the part in unincorporated DeKalb County (house numbers higher than 1036) is not included as we cannot patrol it - our officers are Atlanta City and cannot patrol unincorporated DeKalb County. 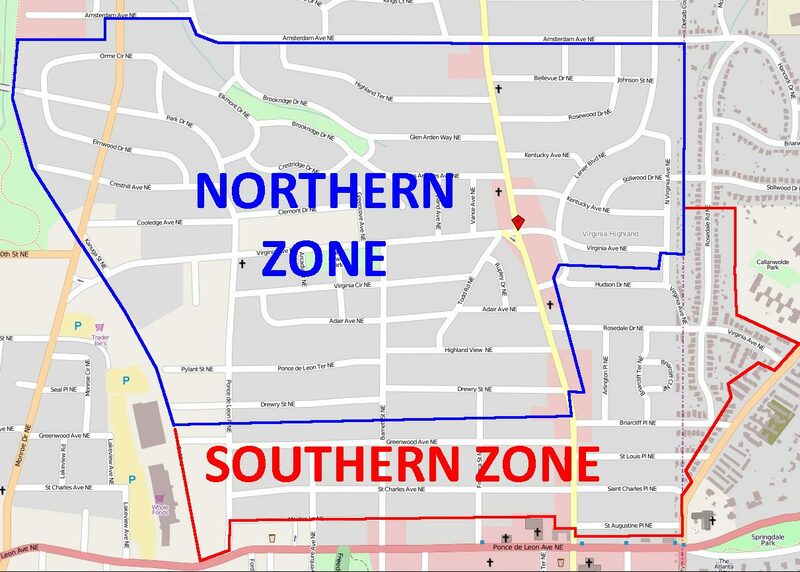 As of October 2012, the zones (north and south) largely don't matter anymore to members. They are used internally by the patrol officers — any given patrol shift will concentrate on one zone or the other, but again, this will not matter to members. If a member calls from anywhere in Virginia-Highland and there is an officer patrolling the north or south zone at that time, then the officer will respond to that member.